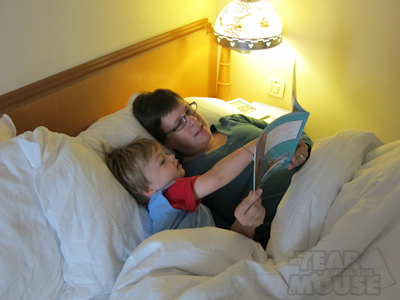 If you haven’t read Part 1 of our cruise trip report, be sure to start there! 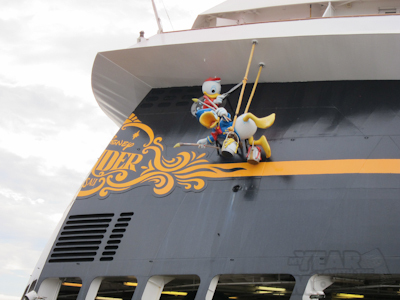 The Disney Wonder is really a great ship. If you haven’t been on a cruise before, it’s hard to grasp the magnitude of such a giant floating thing bobbing around–well there’s another thing, on the large cruises you don’t do a lot of bobbing around. I’m really prone to motion sickness and tend to do quite well on cruises. We did have one day of choppy seas but I took a little Dramamine (hint: bring it from home because it’s pricey in the gift shop–shockingly) and had no problems. So if you’re thinking about cruising but are really worried about motion sickness, I would encourage you to try a cruise with some medicine in your toiletry bag. It’s a great trip! Anyway, the Wonder is large. And even the masthead is adorable. You can see that the Wonder is constantly under improvement. 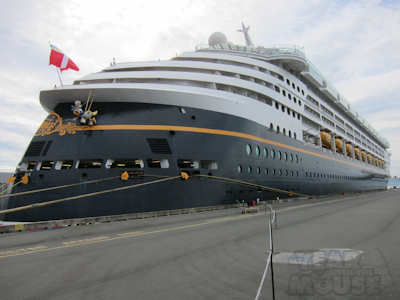 The ship was is really great condition, speaking of “under improvement.” The Wonder is, I believe, the oldest ship in the Disney fleet (READER CORRECTION: the Wonder is the second oldest ship in the fleet–the Disney Magic is one year older), but you wouldn’t be able to tell by looking at it. Disney does such a great job keeping everything neat and trim and in working order. Everything looked fantastic and the ship didn’t seem to show much wear at all. And that can’t be easy with 6 billion kids running around. Kevin’s favorite part was the ship’s whistle. Rather than just a HOOOOONNNNNKKKKKK it blew a very nice “When you wish upon a star” to announce port comings and goings. Even the shipboard announcements were delivered to that tune, which was such a great Disney touch. Seriously, they think of everything. There were just a few negatives we encountered that I’ll cover. One was our first shore excursion, or what Disney calls a “Port Adventure.” We stopped in Victoria, Canada (our trip started in Vancouver, stopped in Victoria, had 2 days at sea, stopped in Ensenada, and ended in LA) and the excursion I signed us up for sounded like it was going to be fun–a horse-drawn trolley tour through the city. Unfortunately, it turned out to be kind of boring, especially for Theo, and since it was an hour with no stops, he got really squirrely and tantrumy at the end. It put a damper on the morning because it was so tough for him and we spent most of the tour trying to prevent him from standing up or losing his toy cars. So if you’ve got an antsy little one like we do, the tour of Victoria is not the excursion I’d recommend. Our weather was pretty much overcast the whole time. Rain had been predicted for the Canada portions but we never got more than a sprinkle here and there. Unfortunately, even all the way down to Ensenada we had dark skies and a chilly wind. The nice thing was that the pool was really heated to a very comfortable temperature, so you could go swimming. As long as you stayed in the pool everything was just fine, but getting out–brrrrrrrr. Poor Theo, the last day (in Mexico!) he and Kevin went swimming and had a blast, but then he cried when Kevin got him out of the pool, even a couple of big towel-hugs afterwards, and went on a plaintive “Daddy carry? Daddy carry?” back to the room. But for the most part the weather didn’t bother me too much. It’s not like Disney can control the weather either. A few of the rooms had those little fabric hanging bags. They were SO cute and really a lot of fun! Reader Update: The hanging bags are called “Fish Extenders” and they’re for all kinds of goodies! If Theo had been a bit older I likely would have gone to the nines with the door decorations. Next time for sure. I also showed you the MYWTM magnets I had–it was very fun walking past a room seeing one of those too :). I wonder if the door decorations would be allowed on the Dream. Sprite’s birthday is literally the day we board the ship and I wanted to do something special for her since she’s not getting a party this year. (Going on a cruise should be enough, right?) Maybe stopping by Party City and picking up some Princess decorations would be a cheap way to start her birthday right? 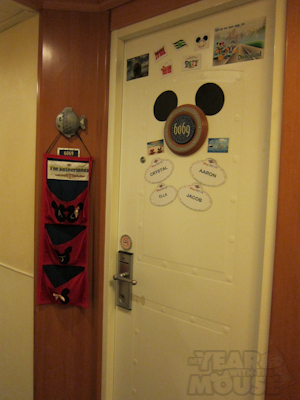 Yep–door decorations are allowed on all the Disney ships! You just have to use magnets–no tape or adhesives of any kind. Also, bring strong magnets, since the metal is separated a bit on some doors and my business card-style MYWTM magnets seemed to stick better to some doors better than others. So awesome! I checked out some threads for people who took it quite seriously. We’re not going too extreme, but some Princess magnets and spelling out messages in magnets should be fun. What are those fabric bags for? And what magical device is it suspended from? 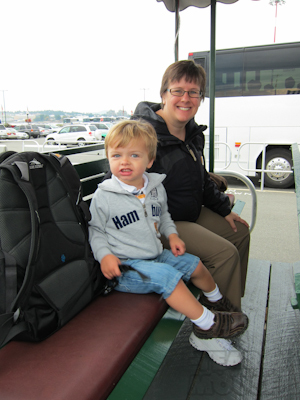 I love the idea of the cruise but I think we’ll wait for our youngest to get a little older first. When can they start going to the kids clubs? They can start the kids club when they’re 3 and potty trained! It’s a great activity program and really for all ages, except Theo who had to be in the nursery. The fabric bags are, I believe, mailboxes for each family member. They’re hanging from this fish clamp thing that every room has where they clamp on your spa reservations and such. Very cute. Ohh, thanks!! I was wondering, and they are all SO cute! Next time I’ll head to the DIS first! That is our families door you posted up there with the FE pouch and all the decorations 🙂 I’m glad you liked it so much to take a photo, we had a blast decorating it! AWESOME!!!!! Thanks for making your way over here! 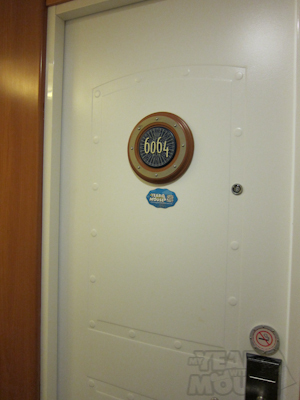 Your door was definitely the best one on our floor–actually one of the best on the ship out of the various floors I wandered around. Where did you get the “cast member” name tags? From someone on DIS? I realize this is a little late in answering lol but just made my way back here again. I made (ie found them on disboards and printed) mouse ears for every room in our party (there were four rooms). They were very cute! I also had lots of little Mickey Heads that were pictures of things we liked. We didn’t do the FE, because the twins were too little, but we will next time!